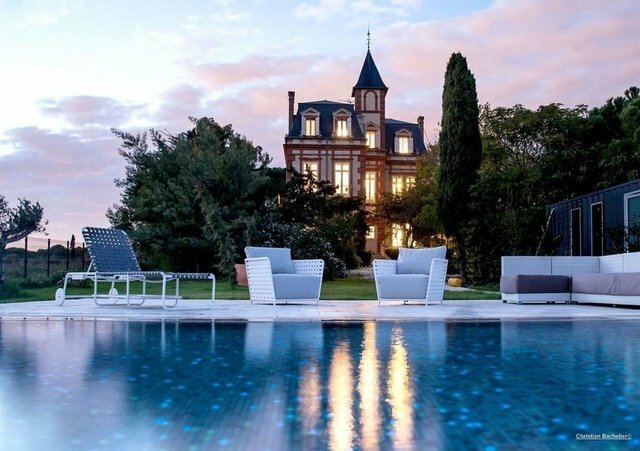 This splendid little 19th century castle in the vicinity of Perpignan, designed by Petersen, overlooks the waters on a plot of 1.6 hectares; the sea, closer to home, the natural flamingo reserve, and nearer still, the swimming-pool, which is transformed into a sea of stars in the evening. The property was exquisitely renovated in 2013, adding technological modernity while preserving the atmosphere of the place. Guest house, very contemporary pool house/summer kitchen, chicken coop, sports room, garages & car-port and horse arena of nearly 1000m² with box, for an incomparable lifestyle.